Good Practice IS a Good Traveller, just ask a Cash Machine Bandit. 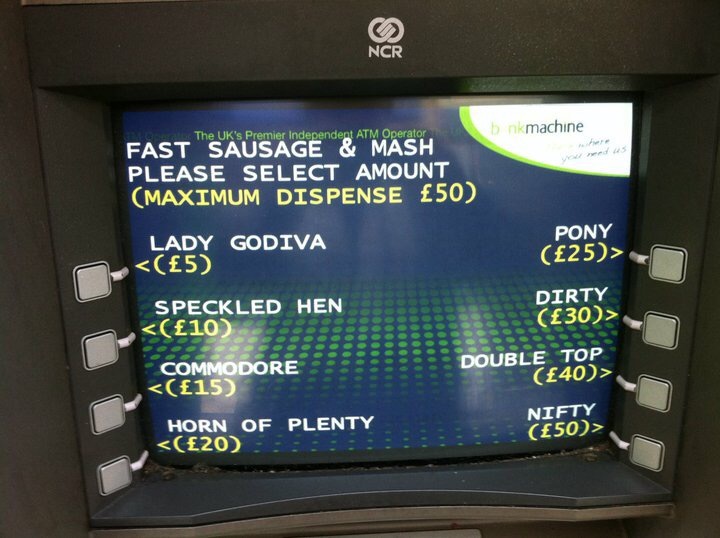 Cockney Cash Machines (ATMs if you like). 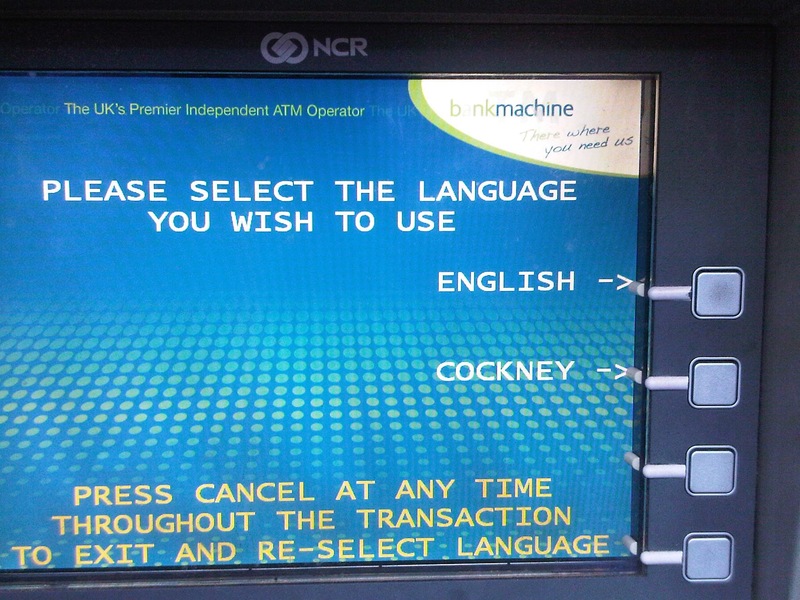 This is brilliant, a while back a company that provides cash machines built them with the option of conducting your transaction in your chosen language of; English or Cockney. This probably wouldn’t work brilliantly well in the rural areas of Gwynedd, but for East End London it was a success. According to this BBC article, where there was a choice, almost 20% of people chose to carry out their transactions through the medium of Cockney (Cor Blimey, sorry I couldn’t resist). So, if you are looking for; some Sausage and Mash, and can remember your Huckleberry Finn; you’ve a choice between a Lady Godiva, Speckled Hen, Commodore, Horn of Plenty, Pony, Dirty or a Nifty. Oh, and don’t forget your Fleet Street. Cushty! How to rob cash machine? Massive disclaimer – this isn’t advice. Under NO circumstances should you do any of the following. A little while ago, using an exemplar of international ‘good practice’, there was a spate of cash machines being robbed across the UK. You can read about it in this example that happened in South Wales (the Bandits came across the border, from Bristol, obviously). Don’t forget to stand well back…..
Cash Point Explosion Good Practice Case Studies. I’m not saying that there is a case study written up on ‘how to blow up a cash machine, with commonly available tools’. However when you put ‘how to blow up a cashpoint machine’ into your internet search engine, there is a lot of information available, and it doesn’t take a genius to work out what to do. This link to a 2015 an article in the Daily Mirror talks about the ‘craze spreading from Mainland Europe’, while in 2014 the English Russia website reported ‘raids on 20 ATMs’. If you look closely enough at the internet, you’ll find quite a lot about cash machine robbery. Law Enforcement ‘Friend’: “this started in Russia and Eastern Europe. Organised criminals are very effective at exchanging information on how to commit crime”. Slightly Dodgy Geezer ‘Friend’: “there’s probably an instructional ‘how to’ video about this on the Darknet*. Do you want me to look…..” Me: Nooohhhh, please don’t, stop now! *I should explain, Darknet is somewhere you don’t want to go. It’s the sort of place that if criminals did have an organised method for sharing ‘good practice’, it would probably exist on the Darknet, a sort of ‘Evil Twin’ to what they do at GoodPractice.Wales. Good Practice IS a Good Traveller. Getting right back to where I started, it seems clear from the spread of ‘alternative methods of cash point opening’ that some good practice does travel, extremely well. I’m not sure we can replicate this context in the world of public service good practice. It does however serve as a good reminder that using the phrase ‘Good practice is a bad traveller’ doesn’t really stand up. It’s not a simple process, if the circumstances are right, good practice goes off with a bang……. (I’m sorry). So, if anyone uses the phrase in front of you again, just respond deliberately and slowly in a low tone…. “what about blowing up cash machines……”. You could even try it in a Cockney accent…..
Why is Good Practice a Bad Traveller? One point for you, Chris: I’ve just read the latest Jack Reacher book (don’t judge) and in it the author refers to the dark web a lot. It’s a major plot point. However, according to our man, the dark web is a place of broken sites with outdated links and being of no more use to anyone, little visited. The deep web on the other hand is the one your looking for maybe? ‘Below’ the attention of the search engines, and deliberately so. Where criminal activities that attest to the worst of human nature are hidden away and shared on equally invisible social networks. I don’t know whether this is right or not, but an interesting addition to your story? The Darknet, Darkweb and Deepweb is confusing territory for me. I thought I’d better stop searching the term unless I wanted a visit from the NSA or something similar. Great post! Look forward to sharing this next time someone questions the validity of our work 😉 Nice one Chris! I was in the East End of London this week. I should have gone scouting for a Cockney Cash Point.